March more or less came in and went out like a lion. The below normal temperature trend we experienced in February continued through March, averaging 5.2 F below normal. Western and southern Iowa experienced wetter than average conditions in March while the rest of the state experienced below average. Consequently, the preliminary observations have March precipitation at 0.10 inches below normal across the state. March 2019 was the 30th coldest March on record and the 58th wettest in 147 years of statewide observational records. Figure 1. Precipitation (in.) 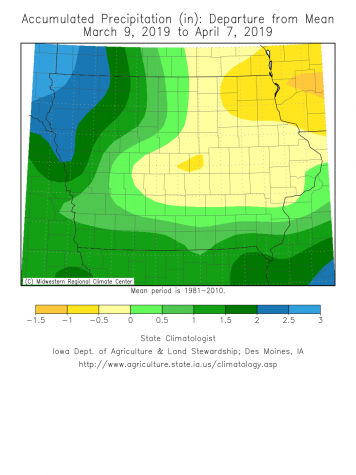 departure from the mean from March 9 to April 7, 2019 shows western and southern Iowa above average and the rest of the state below average (Source: https://mrcc.illinois.edu/state_climatologists/iowa/prcpdev-30days.png). Western Iowa, eastern Nebraska and part of South Dakota experienced devastating floods following the “bomb cyclone” that came through in March. 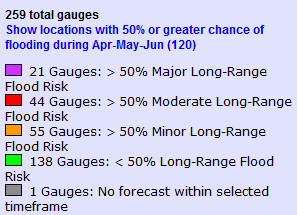 More flooding could be experienced in Iowa, particularly in eastern Iowa (Figure 2). Parts of northern Minnesota still have 1 to 6 inches of water equivalent of snow on the ground that needs to melt, which will eventually makes its way down to the Mississippi. This is why the predications for eastern Iowa are higher compared to other parts of the state. As we look towards #plant19, we want to be thinking about field conditions for spring fieldwork. Looking at the weather outlook, the 3-4 week outlook favors above normal temperatures with equal chances for above, below, or climatologically normal precipitation. The 6-10 day outlook indicates more normal precipitation. 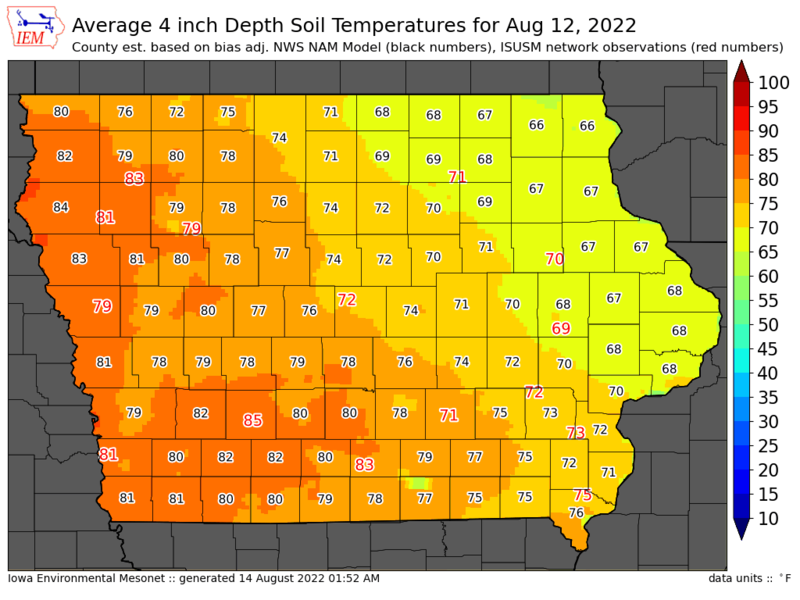 Given the current wet soil conditions and the lesser chances for dry conditions, #plant19 could present some challenges. 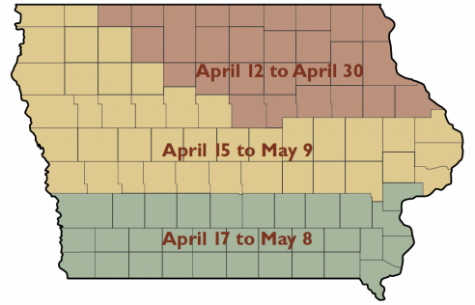 We are still on the early side of the ideal planting window in Iowa as it is recommended to plant corn from mid-April to early May to achieve the highest potential yield; however it will be important to evaluate conditions field by field. Figure 3. Corn planting window to achieve 98% yield potential (Corn and Soybean Field Guide, IPM 0001, 2016).